I worked for six weeks on this topic at the ‘Communauté d’Agglomération du Bassin d’Aurillac’ in France and was awarded top marks for it. What next? Mapping fruit trees in the area? In September 2016, I was granted a six-week internship by the Environment Services department of the ‘Communauté d’Agglomération du Bassin d’Aurillac’ (CABA)1, a district council serving 57,000 citizens on a 500 km2 territory in the Auvergne region of France. 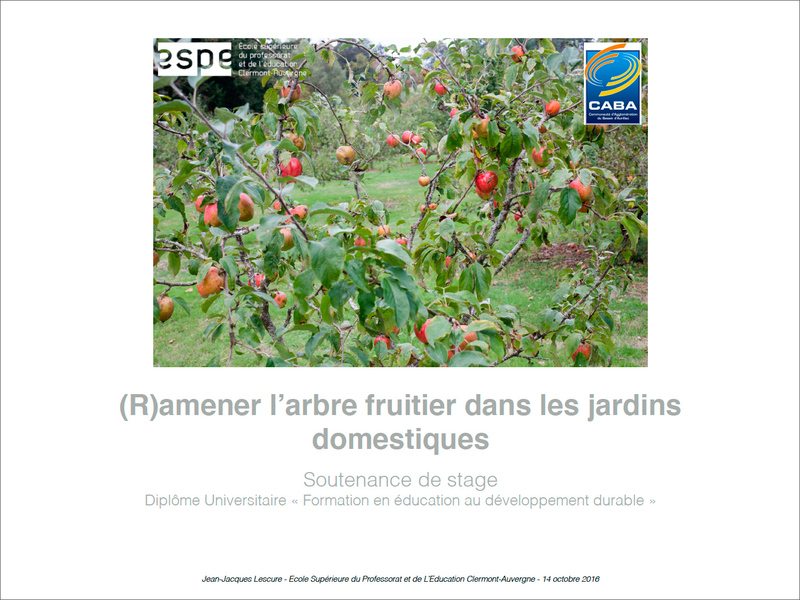 My mission was to provide directions for ‘bringing back fruit trees to domestic gardens’ in the area and I worked with its centre for education to the environment La Plantelière to design an action plan. The internship was also a unit of the postgraduate diploma in Education for Sustainable Development I was following at the University of Clermont-Auvergne in 2016 and would therefore be assessed as such. During the first four weeks, I established a strategy and a list of recommendations. I also created a public event to implement one of them: the reconnection of people to garden fruit, often left to rot under the trees. More on this action in our post ‘Gourmet compote workshop at La Plantelière‘. I presented my internship interim report at the end of the four weeks and was awarded top marks by the University of Clermont-Auvergne and its Swiss partner the « Haute Ecole de Pédagogie de Fribourg ». Internship report presented on 14 October 2016, cover page. The last two weeks of the internship, carried out in January, enabled me to propose a second implementation of the strategy I drew up in 2016. One of my recommendations had been to focus on fruit storage to bridge the gap between the production and consumption of garden fruit. To that end, I drafted the synopsis of a fruit storage workshop aimed at local gardeners and fruit users to be added to La Plantelière’s educational programme. I also designed a modular storage capability for the centre to experiment with a more systematic use of the fruit that grows in its orchards. I presented my full conclusions in a report called ‘La Plantelière action plan 2017: from tree to plate’. 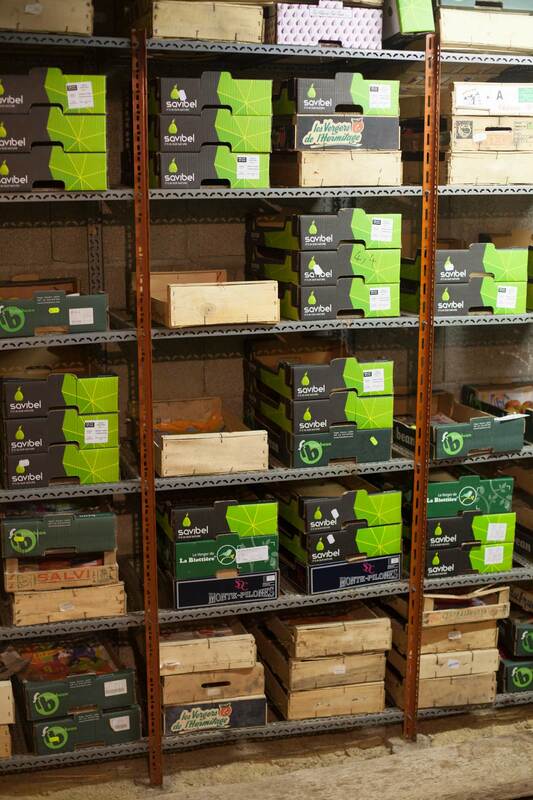 These shelves, which can store up to 700 kg of fruit in the cellar of a domestic garden owner, inspired my design. Photo 20 January 2017, Aurillac. Being part of CABA’s team was also an opportunity for me to learn about the Geographic Information Systems used to render services to citizens. Aerial view of the ninety fruit trees that grow in La Plantelière. Screenshot 29 January 2017, source geoportail.gouv.fr. Combining various techniques from satellite observation to drones and ground surveys, geomatics evolve quickly towards more and more accurate cartographies of our territories. It would be great to manage a local or wider mapping project aimed at documenting our knowledge of fruit trees in the various spaces where they grow, including domestic gardens. It would inform citizens and policy makers willing to promote fruit trees as an alternative source of healthy food reducing food miles and nurturing biodiversity. Mapping in spring might help. 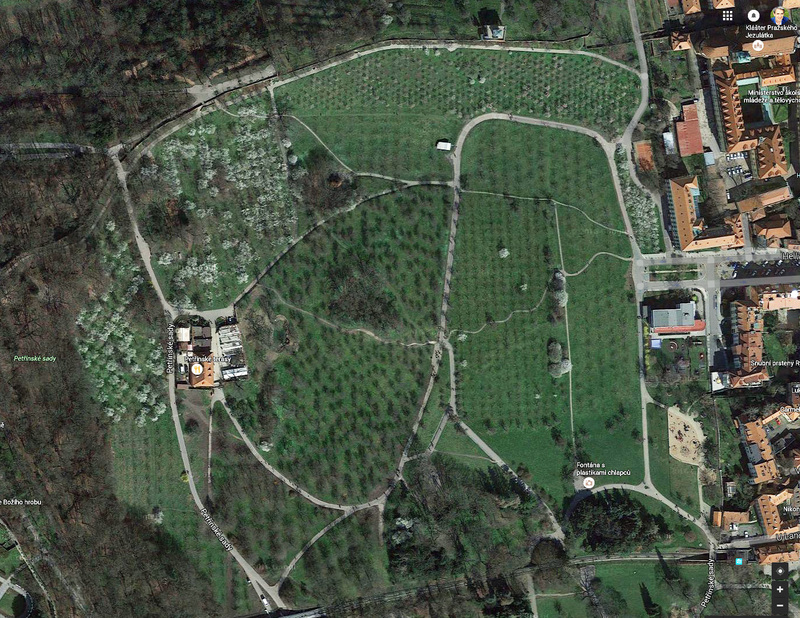 Two thousand fruit trees starting to blossom in a public orchard on Petrin Hill, central Prague, Czech Republic. Screenshot 10 July 2016, source Google maps. For more information on Prague’s orchards, read our article ‘Blossoming in the public spaces of Prague‘. To that end, I would need to be commissioned, as such projects are collaborative and require to be part of, or to be a client or a supplier, of an organisation that has access to the relevant information and tools. In the meantime, I will pursue my investigations and for instance visit the exhibition ‘Maps and the 20th Century: Drawing the Line‘ at the British Library in London to discover “how maps made the world we live in”. This entry was posted in Fruit for sustainable development and tagged Aurillac, France, La Planteliere by Les Jardins d'ici. Bookmark the permalink. I visited the maps exhibition at the British Library in London on 22 February. I must say I didn’t find it very inspiring as most of the maps presented were expressions of coercive powers. ‘Les jardins d’ici’ is about freedom rather than control.